Stems occasionally whitish pruinose, slender to moderately stout, to 6 mm diam., acrid- to sweet-tasting: scales concolored, brown or slightly mottled, often darker near point of attachment, lanceolate, usually symmetric, margins entire to denticulate. 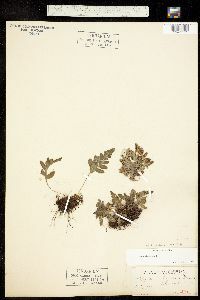 Leaves to 35 cm. Petiole slender, to 1.5 mm diam. Blade oblong to lanceolate-ovate, occasionally deltate, pinnatifid, usually widest at or near middle, to 7 cm wide, herbaceous to somewhat leathery; rachis sparsely scaly to glabrescent abaxially, glabrous adaxially; scales linear-lanceolate, usually less than 6 cells wide. Segments oblong to linear-lanceolate, less than 12 mm wide; margins entire to crenulate or obscurely serrate; apex obtuse to acute; midrib glabrous adaxially. Venation free. Sori midway between margin and midrib, less than 3 mm diam., oval when immature. Sporangiasters absent. Spores more than 58 µm, rugose to verrucose or tuberculate, surface projections commonly less than 3 µm. 2 n = 148. Sporulating summer--fall. Cracks and ledges on cliffs; on a variety of noncalcareous substrates, rarely on limestone; 300--3500 m.; B.C. 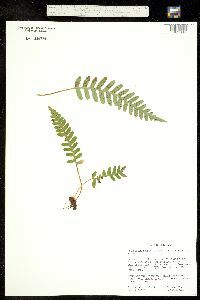 ; Ariz., Calif., Colo., Idaho, Mont., Nev., N.Mex., Oreg., Utah, Wash.; Mexico in Chihuahua, Baja California. 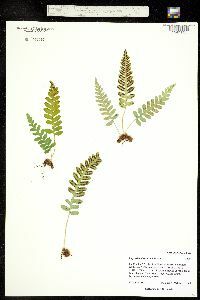 Using morphologic and chromosomal data, F. A. Lang (1971) proposed that Polypodium hesperium originated through allotetraploidy involving P . glycyrrhiza and P . amorphum , a hypothesis recently supported by electrophoretic studies (C. H. Haufler, M. D. Windham, and E. W. Rabe, unpublished). Variations in spore surface morphology and banding patterns observed in isozyme studies indicate that P . hesperium may have originated more than once from different individuals of the same species. 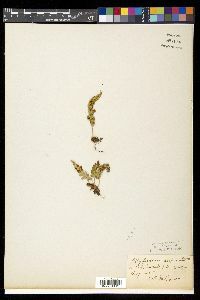 Some collections of P . hesperium can be mistaken for P . glycyrrhiza , but the latter species is easily distinguished by its pubescent rachises, linear blade scales, and smaller spores (less than 58 µm). Although P . amorphum has sporangiasters and P . hesperium lacks them, misshapen sporangia in P . hesperium can mimic these distinctive soral structures. Therefore, it is often necessary to use a combination of soral, stem scale, and blade scale features (discussed in the key) to separate P . hesperium from P . amorphum . Hybridization occurs between P . hesperium and each of its progenitor diploids to form triploid individuals with misshapen spores (F. A. Lang 1971). Rare, sterile, tetraploid hybrids with P . saximontanum have also been detected (M. D. Windham, unpublished). 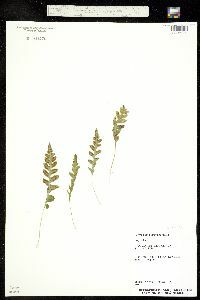 RHIZOMES: 2-6 mm in diameter, short- to long-creeping, few-branched, sometimes pruinose, the scales 3-5 mm long, lanceolate, acuminate at the tip, truncate to slightly rounded at the base, usually concolorous but occasionally with a faint central stripe of darker nonclathrate cells, tan to brown, the margins entire or denticulate. LEAVES: 3-25(-35) cm long. 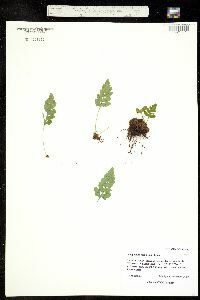 PETIOLES: longitudinally grooved adaxially, green, sometimes brown to purplish brown at the base, with sparse minute glandular trichomes. BLADES: 1.5-6.5 cm wide, oblong-triangular to narrowly ovate, with 3-16 lateral lobes, the proximal lobes appearing alternate or less commonly opposite along the midrib, the lobes 7-30 mm long, 2-12 mm wide, glabrous or with a few minute glandular trichomes along the midrib adaxially, with sparse minute glandular trichomes and inconspicuous basally attached lanceolate scales along the midrib and proximal portions of lateral veins abaxially. SPORES: 58-75 m long, the surface rugose or finely verrucose. 2n = 148. NOTES: Shaded ledges and crevices of rock outcrops of canyons, usually on igneous and volcanic substrates, but also on sandstone and rarely limestone: Cochise, Coconino, Gila, Graham, Pima, Yavapai cos. (Fig. 1B); 1500-3150 m (4920-10,350 ft); w U.S.; w Can. ; nw Mex. 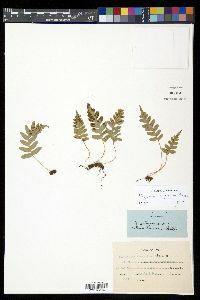 36 CANOTIA Vol. 5 (1) 2009 REFERENCES: Yatskievych, G. and M.D. Windham. Vascular Plants of Arizona: Polypodiaceae. CANOTIA 5 (1): 34-38, 2009.